During the late 1940's Jack Woodley was contacted by Bernard Leach & and his son David, then, after lots of proto-type design work & travelling between St.Ives & Newton Poppleford an existing design was remodelled to form the new potter's wheel, known as the original Leach kick wheel. It was then produced for approximately thirty years and many are still being used to this day. They eventually found their way to all corners of British Isles and a few went over to the USA. Approximately 800 were produced in total. 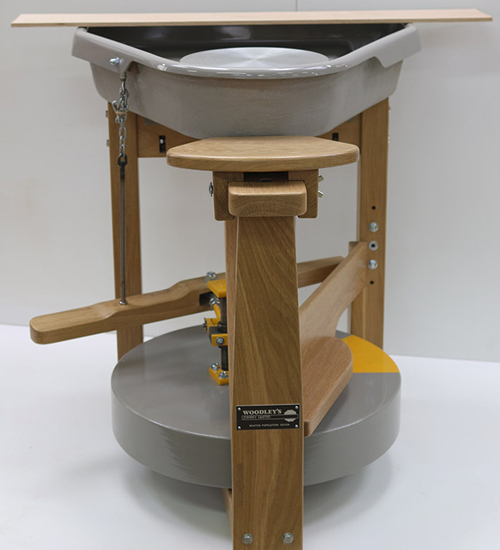 Now seventy years on – the new generation of Woodley's are back with a new kick treadle wheel – and whilst still echoing the aesthetics and high working qualities of the original wheel – our new design has a much-improved and more efficient mechanical action, uses more suitable and higher quality materials, has improved ergonomics leading to a more user friendly experience. 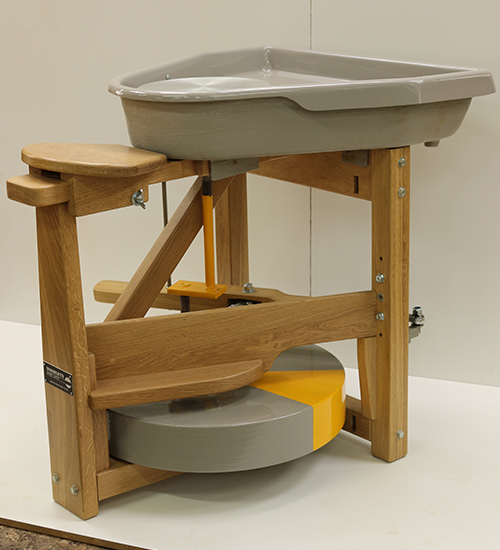 The principles behind the new pottery wheel's frame was to get it through a standard door without taking it pieces. Apart from taking the tray off, the new potter's wheel will go through a 2ft 6' wide doorway. The next problem was to solve the hinge between the crank and the kick arm and this issue was solved by using a split nylon bearing and ball end joints on the connection to the kick arm, with a hinged joint between them. The power stroke puts the con rod in tension while the end of the kick arm is mounted on a ball end joint, giving freedom of movement. The foot end of the kick arm is supported by a rigid rod which operates from the radius of the adjustable chain attached to the tray which makes for a very relaxing and easy kick motion. The entire pottery wheel works on a true geometric engineering principle to overcome five different radii. The crank is solid welded steel running on sealed for life ball bearings. 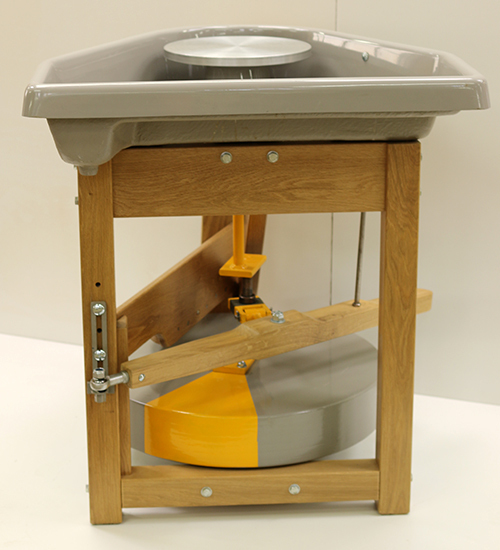 The fly wheel is made from moisture resistant MDF because of its density and toughness. The frame is constructed from solid oak and braced with mortice and tenon joints bolted through for rigidity and incorporating a foot rest. The adjustable seat can slide forwards and back and is designed with comfort in mind. The frame has been designed on three legs for stability. The wheel head is cast aluminium and turned with centering grooves with a morse taper fit. The glass reinforced plastic (GRP) tray is moulded in one piece with a drainage hole which overhangs at the front, with the dry internal shelf located above the tray base. The tray edge has a radiused top edge lip. 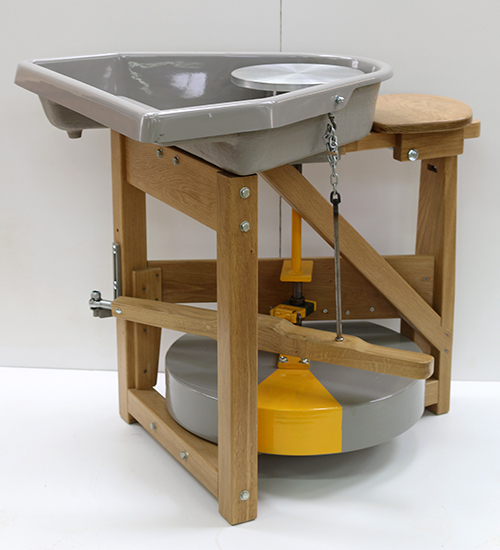 The large tray allows for water pots to be contained inside, and is designed to contain dripping hands, wet sponges and tools which can all be stored on the internal shelf. This means that there are less dripping hands outside of the tray. This design is probably the best kick, treadle potter's wheel ever made.